Whenever I hear tart I think something sweet or something very eggy, but today we are sharing a Goat Cheese Tart recipe that is neither sweet nor eggy. And, you are going to love it! We've combined three different cheeses and wrapped them in salty, tender prosciutto to change up your breakfast routine. Check how to make this simple recipe below! Who Doesn't Love A Savory Tart? When I hear the word tart, honestly, I think of a dense, buttery crust and sweet, chocolate filling. Basically, to me, a tart is always something sweet. However, that's not fair to savory is it? I've always been a savory over sweet person, but I never appreciated the savory tart, until today! These goat cheese tarts are dense, moist, filling and always delicious. Plus, they are a lot easier to make and have ready for meal prep or a dinner party than a sweet tart recipe. That being said, if you are in the market for a sweet tart, we've got just the one for you! Our Dark Chocolate Tart will change your life! Guaranteed. 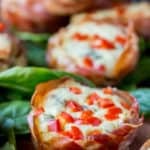 As I've mentioned above, these tarts work great for meal prep or even a quick desk lunch at work, but what about as low carb appetizers? If nothing else, these tarts will "wow" your guests and have them asking your for the recipe before they leave! Some other great low carb appetizers to serve at a holiday party or gathering are our Fried Goat Cheese for another cheesy favorite, our Simple Deviled Eggs, a fan favorite, and of course Buffalo Chicken Dip alongside some veggies or store bought flackers! If I haven't convinced you yet, then you just have to make these goat cheese tarts for yourself. We promise the entire family will love them and they will became a staple in your household. Easy to make, customize-able to your taste, and delicious every time. If you make this Goat Cheese Tart recipe, be ready to whip up a second batch shortly after! 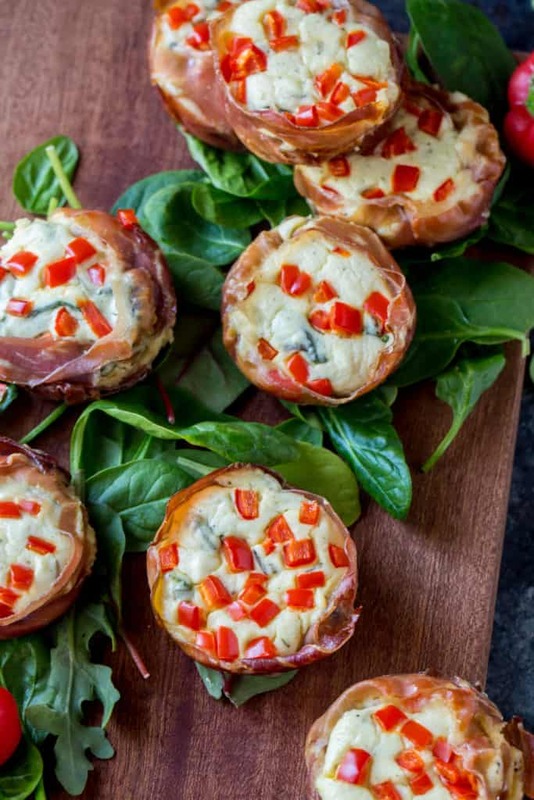 Recipe can be quickly added to MyFitnessPal - Search "KetoConnect - Goat Cheese Tarts"
Melt butter in a skillet set over medium heat. Add kale, garlic, and red pepper flakes and saute until fragrant and wilted, ~2minutes. Remove from heat and set aside. 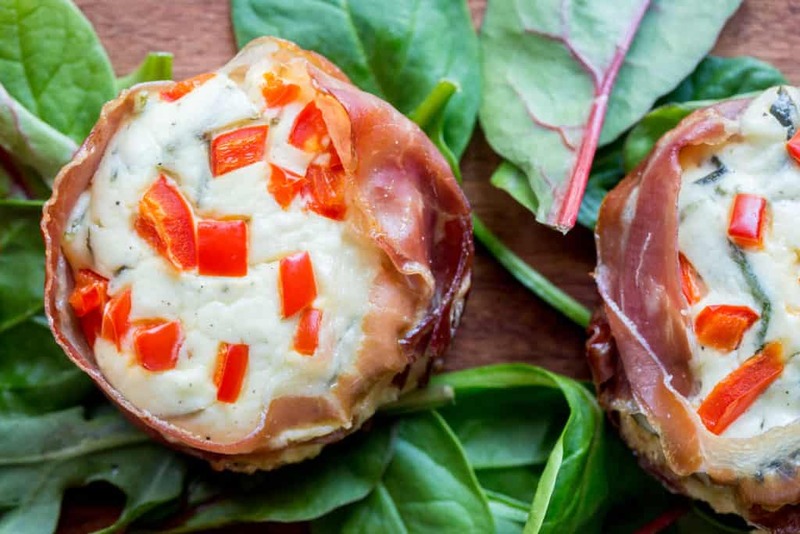 Spray a muffin tin with non-stick spray, then carefully line 8 cups with prosciutto, creating a cup. In a small bowl, lightly whisk eggs. To the same bowl, add cream cheese, goat cheese, Romano, rosemary, salt, and pepper. Stir together until smooth. Add the mixed greens to the cheese mixtures, and mix well. Spoon the mixture into each of the prosciutto cups, dividing it evenly. Top with diced red pepper. Bake for 20 - 25 minutes until golden brown and set. Let stand for 5 minutes to cool slightly and firm up.